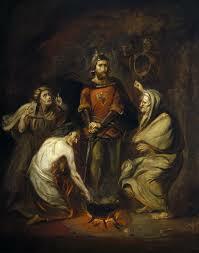 William Shakespeare’s Macbeth Summary: This drama is one of the great tragedy themed plays by William Shakespeare. The themes illustrated in the play include ambition, fate, deception, and treachery. 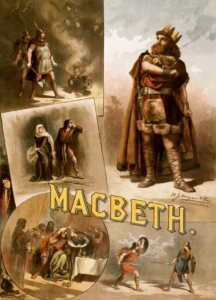 Probably composed in late 1606 or early 1607, Macbeth is the last of Shakespeare’s four great tragedies, the others being Hamlet, King Lear, and Othello. It is a relatively short play without a major subplot, and it is considered by many scholars to be Shakespeare’s darkest work. Lear is an utter tragedy in which the natural world is amorally indifferent toward mankind, but in Macbeth, Shakespeare adds a supernatural dimension that purposively conspires against Macbeth and his kingdom. 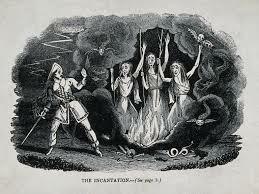 In the tragedy of Lear, the distraught king summons the goddess of Chaos, Hecht; in Macbeth, Hecate appears as an actual character. Three witches decide to confront the great Scottish general Macbeth on his victorious return from a war between Scotland and Norway. The Scottish king, Duncan, decides that he will confer the title of the traitorous Cawdor on the heroic Macbeth. 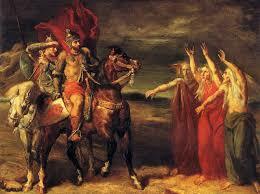 Macbeth and another General called Banquo, happen upon the three witches. The witches predict that he will one day become king. He decides that he will murder Duncan. Macbeth’s wife agrees to his plan. He then murders Duncan assisted by his wife who smears the blood of Duncan on the daggers of the sleeping guards. A nobleman called Macduff discovers the body. Macbeth kills the guards insisting that their daggers smeared with Duncan’s blood are proof that they committed the murder. The crown passes to Macbeth. More murders ensue and the bloodied ghost of Banquo appears to Macbeth. Lady Macbeth’s conscience now begins to torture her and she imagines that she can see her hands covered with blood. She commits suicide. Macduff kills Macbeth and becomes king. Shakespeare uses a lot of imagery in this play to develop atmosphere, mood, and characters. The images are clearly thought out and give and make a certain impression on the mind of the audience. Often, the images foreshadow something in the future. For example, the image of the bloody knife before Macbeth in the second passage foreshadows the brutal cold-hearted murder that immediately follows. Blood is a recurring image in this play to denote guilt. Lady Macbeth frets in her sleep of not being able to wash the blood off of her hands since she feels so guilty about the murder. The images of the bleak sky continue through the play displaying the lack of order and peace within the kingdom. Shakespeare uses a lot of symbolism in this play. The most often used is that of blood symbolizing guilt. Blood is stained on Macbeth’s imaginary knife before the murder. Both Lady Macbeth and Macbeth suffer from visions of blood after the murder, especially Lady Macbeth who is driven insane by it. The blood is seen as their guilt and they cannot get rid of it until the crime is punished by their own deaths. Another symbol used in the play is the raven symbolizing ill omen. The raven is often referred to as a storm crow since it tells of an upcoming storm. It served the same purpose in the play being seen before tense parts. Another symbol in the play is sleep. Sleep represents innocence, and those who cannot have sleep, are so because they have lost their innocence and are overcome with guilt.